In 1984, a Japanese-born American comic book creator Stan Sakai created his first Usagi Yojimbo comic to be published by Thoughts and Images in their Albedo Anthropomorphics issue #2, released in November of that year. Set primarily at the beginning of Edo period of Japan, with anthropomorphic animals replacing humans, the series features a rabbit ronin, Miyamoto Usagi, whom Sakai based partially on the famous swordsman Miyamoto Musashi. Okay, I copied that from Wikipedia, but why not use an easy source when it's good and available. Anyway, the series went on to be published primarily by Dark Horse Comics, but when the game came out, it was most likely still being published by Fantagraphics Books. It's a rare specimen of a game to be based on a comic book series, instead of a cartoon or a movie, so it's pretty unique for its time before we even get to the specifics. The game closely follows some of the themes of the comic. It plays like a side-scrolling hack'n'slasher half of the time, and the other half you have to practice patience and manners. The main goal of the game is to save the young panda daimyo Noriyuki from the claws of Lord Hikiji, who, according to the comics, is responsible for the death of Usagi's father. Before we get to the inner workings of the game, let it be said now that there's an unheard of amount of freedom of choice in procession for a game from 1988. 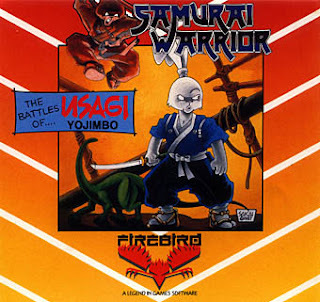 Samurai Warrior has always been a firm favourite of mine, despite my not being very good at it. Back when I was a kid, I used to play it a lot, using some sort of cheat mode to get through the game and see everything that it had to be seen. But that was only on the Commodore 64, the game's original platform. This time, I'll take a better look at it without a safety net, and compare it to the two conversions. There were ports for Amiga and Atari ST in the making as well, but they were cancelled for some reason, which is really a shame. It's a brilliant game, if slightly aged in a bad way, but a really unique one, and any self-respecting retrogamer should not miss this one. This time, we have something very unusual in comparison: a disk version on the Spectrum. Unfortunately, I've never even seen a +3 Spectrum, so I can't tell for sure if the emulated disk drive works like it should, even though I turned off the fast disk access option. Same thing goes for the Amstrad disk, but if they're correct, the results are pretty amazing in both occasions. 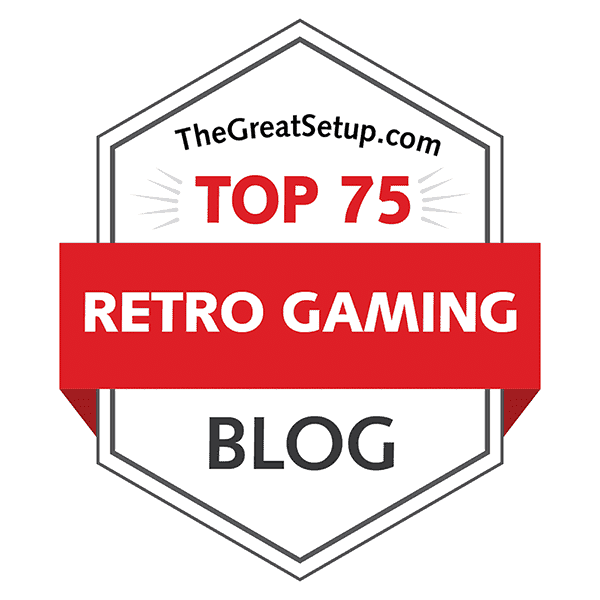 In the case of tape loading, there is no dramatic difference between C64 and Spectrum, and the Amstrad tape loading result shouldn't be a surprise to anyone, who has followed this blog or knows it from their own experience. The tape versions all use a variation of Firebird's most well known loading scheme, retrospectively christened "Bleepload", which I've always hated with a passion, but the disk versions seem nice. AMS DISK - 11 seconds? SPE DISK - 8 seconds? Samurai Warrior features a rare feature for the time: a practice mode. This is featured in all the versions of the game. It lets you get used to the controls in both peaceful mode and attack mode, as you're placed in front of a bunch of haystatues in an otherwise empty field. You can practice your moves against your mock enemies there without interruption. In peaceful mode, your two main actions are bowing - fire+down (to greet passing samurais and villagers etc. ), and offering ryo - fire+right (for begging peasants, buying food at the inn, gambling and paying tolls). Both actions have the possibility to raise karma, but neither is useful against enemies. You switch to fighting mode by pressing fire and up. You have two different attack moves that depend on how long you press the fire button, and you parry by rapidly clicking the fire button. You can jump in both peaceful and fighting modes, but the fighting jump is by far the more useful, since you can jump across chasms with this. Now for the game's heart, which is the karma system. Since the game doesn't have a scoring system as such, we are presented with karma points and ryo (money), which are not necessarily connected, but one can sometimes be used to have effect on the other, as is sometimes the case in the real world too. Initially, you have only a couple of karma points, but by greeting beggars or offering them ryo, your karma points will increase. By contrast, attacking innocent people will decrease karma. You only have 3 ryo at the beginning, so you must choose wisely, where you lay your money, because later on, you'll be able to buy food, which will increase your energy. Ryo can be gained from killing enemies and gambling, but it is very advisable to be cautious with that. All this is crucial, because you only have one life to lose. So, be sure you'll pay respect to those who act with civility towards you, because every action you make causes a reaction later on. Not as drastically, as the programmers originally apparently wanted to, but it's still a big theme in the game. If your karma gets to zero, the game ends by Usagi performing seppuku. Each of the three released versions are side-scrollers, so they should be on a good ground for comparison. The C64 version scrolls neatly by default, but moves in less sync when in fighting mode. Of course, this depends entirely on your actions, but you'll notice the camera has a bit of difficulty keeping up with your running, especially when you learn how to run faster spurts across the screen. It's still a lot faster to just run regularly in the fighting mode, though. This is not nearly the case with either of the conversions. They do have a slightly faster run when in fighting mode, but that's about it. The Amstrad version feels closer to the C64 version in general speed, but both lack the freedom of movement that's so wonderful about the original - it just feels nicely organic compared to the other two. The biggest fault in Source Software's conversions is, by far, the fighting movements. When pressing the fire button, it takes ages to get Usagi into a position from where he can try to hit the enemy. He even makes a brief full stop before moving his sword into position, so it's really painful to try and be nimble when your rabbit samurai feels like a medieval knight wielding a 100 kg longsword. Luckily, your enemies move differently as well, and they are better adjusted to the clonky movements of your unrabbitness, so there's not that much harm done. Since the game is so much slower on the Spectrum, it's only fitting that the levels are a bit shorter than on the C64. Amstrad, naturally, follows the Spectrum conversion, having the same team behind it. Not too shabby, whatever the case. The Spectrum version looks the most fitting for this game, being monochrome and all, but I'd say that while the C64 version doesn't look like a part of this game, it does set an interestingly serene mood while waiting for the game to load. If we think about point number 1, it should be noted that the Spectrum version has the closest interpretation of the comic book characters and the world in Usagi Yojimbo, because the comic book series itself was originally a black-and-white publication (and most of it continues to be). Usagi looks the most like his comic book counterpart, and everything looks clear and detailed. 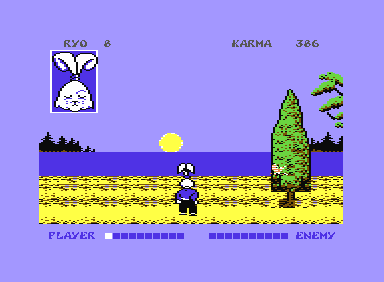 The C64 version looks more like an animated film, with properly supporting colours, although the screen resolution makes everything look a bit blocky, so even Usagi doesn't look exactly like Usagi. Taking point number 2 into closer inspection, the C64 takes the clear lead, because it's the fastest and the most fluent in action. Even the camera movement is a bit unstatic, as you would expect from an action movie. Spectrum doesn't have much of action at all, being the slowest, but at least it scrolls by the pixel, which is something of a rarity. Going through point number 3 and driving around the other two, we're somehow parked in the Amstrad version. It has combined the speed (well, almost) from the C64 original to the detailed hi-res graphics from Spectrum (at least in the lower part of the screen), and then there's the Amstrad colour palette, which is something totally of their own design. It's not bad, really, but it's a weird mish-mash of everything. Granted, it's really a matter of opinion (again), which one works the best for each gamer, but I have to point out that the speed, the colours, resolution, whatever - hold no importance, when the screen size is so small you can barely react to the enemies coming at you from two pixels away. The C64 playing area is spread on almost the whole screen, while the Spectrum and Amstrad versions only have small windows for the play area, while the rest of the screen space is taken by an over-sized HUD. Perhaps it helped keep the scrolling speed high enough for the Amstrad, but the Spectrum is still slow enough to wonder was it all worth it. I'm forced to give three different scores on graphics alone, since there's too many important factors, so I can keep up with my own thoughts. In order, they are: resolution & detail / scrolling / colours. I know it looks weird to have a monochrome version to have better colours than one with some colours, but in this case, the black and white thing works better for this game than a badly coloured one. Still, the C64 version has the most appealing overall look. Neil Brennan wrote the soundtrack for the original C64 version, and an effective one it is too. The main theme is a rocker with an eastern vibe, and the instrumentation in it gives the entire game a very unique feel. Neil has somehow managed to dig up some very eastern-sounding sounds from the SID chip, and the drums sound as good as you could expect from an 8-bit game, if not better. The whole theme song is almost 2 minutes long, and it loops from the solo drum beat. The main theme is played at all times, except when you're in attack mode or when the game is over. When you switch to attack mode, your sword comes out with a swish sound, and your swordhandling is marked with nice clings and splurts when you hit an opponent, and every sword movement is otherwise noted with a nice swish. This, of course, renders the background music drumless, but it's of little difference, when you get the effects. The attack music is very simplistic anyway - you only get a high-energy melody of two notes that change after 4 bars, but it's a very fitting change. The game over music is a 6/8 (I think?) flute-like melody with a delay effect on the bass notes and snare drum, so it's a bit difficult to say if it is, mostly because it has such a rubato feel to it. Very moody and definitely gives you an idea of sunset. When you compare it to what's on the more capable Spectrum, it's almost a day-and-night difference already. During the game, you'll only get some bips and bops for sound effects, which is exactly the amount of noise you'll get in the 48k version, but at least you'll get some two-channel beepy tunes for the 128k version. In the intro, you'll get an insanely shortened version of the main theme, which starts at the second bit of melody, shortens the third bit, and goes to the final important bit from the end of the song, and then loops it. The whole loop lasts for 58 seconds. Surprisingly, I found the beginning of the theme song from an unconventional place: it's when you pause the game. But then, it's only the 8 bars of the melody and then it repeats, so it's almost as bad as not having any music at all. Not that it matters all that much, since you won't really be using the pause button all that much anyway. The game over music is changed to a 4/4 thing, although it fails even there when the third sequence hits in. Although it gets the point through, it severely lacks the ability to create the right mood, mostly because there's no dynamics in the beepy instruments. If you thought that was bad, try out the Amstrad version. The only thing you'll be hearing there is the same shortened theme tune that was in the 128k Spectrum version. No sound effects, no other tunes. Just that one tune that loops after less than a minute, over and over. I don't know which one is worse, that or the 48k Spectrum version with only the few bips for effects. Maybe I do prefer the quieter one. Well, I'm not completely sure this was as unbiased a comparison as I was hoping it to be, but honestly, I had never before properly tried out the two conversions, and I'm glad I did. It's a rare opportunity to see a scrolling action game on the Speccy that scrolls by pixel instead of character. Even if it doesn't exactly fare well in the comparison, it's nice to find something like that, and I'd be interested to find some games that handle this method faster than this particular game. Also, if someone could confirm me the disk loading results for both Amstrad and Spec 128 +3, I'd be grateful. Even though the calculations placed the Amstrad version at the bottom, it beats my preference for it over the Spectrum version just for the slightly better playability. But, even if you take the loading times into account, the conversions wouldn't have much of a chance against the C64 original, it's just that much better. Game completed. The full ending sequence only available on the C64. Thanks for reading, next time I'll be posting my second twofer, so stay tuned!